The History of Locks Museum is a 'not for profit' organization actively researching and preserving the wonderful world of locks. We seek out items from all corners of the world, research them and show them. To this end we maintain both permanent and temporary exhibitions/displays at various locations around the UK. We are keen to show our collections and the historical stories associated with them. - see below for further details on how and where you can see our collections. The History of Locks Museum headquarters are located on the south coast of the UK in Bournemouth Dorset. It is primarily where the research, documentation and preservation of artifacts takes place. We also maintain a working traditional locksmith shop which helps the museum funding. Visitors to the collections are welcome, strictly by appointment, but due to our working/research nature can only be accommodated on weekends i.e. Saturdays and/or Sundays. We have several rooms of items on display; additionally we can also retrieve from storage both artifact and/or document archive boxes if you have specific requests. Historian – Curator: History of Locks Museum Heritage Collection, Reference Collection & Archive. The MLA Heritage Room is located in Rugby, Warwickshire, UK. This permanent exhibition is provided and maintained by the History of Locks Museum. The exhibit is currently under preparation and will be opening spring 2019. Although the exhibit is permanent the actual items on display will periodically change therefore there will always be something fresh and new to see. Proposed floor plan layout below of the spacious Heritage Room at MLA HQ, a special version of the History of Locks Global Catalogue will also be available to view. The exhibit is laid out, more or less, in a chronological date order when the cabinets are viewed in a clockwise direction. 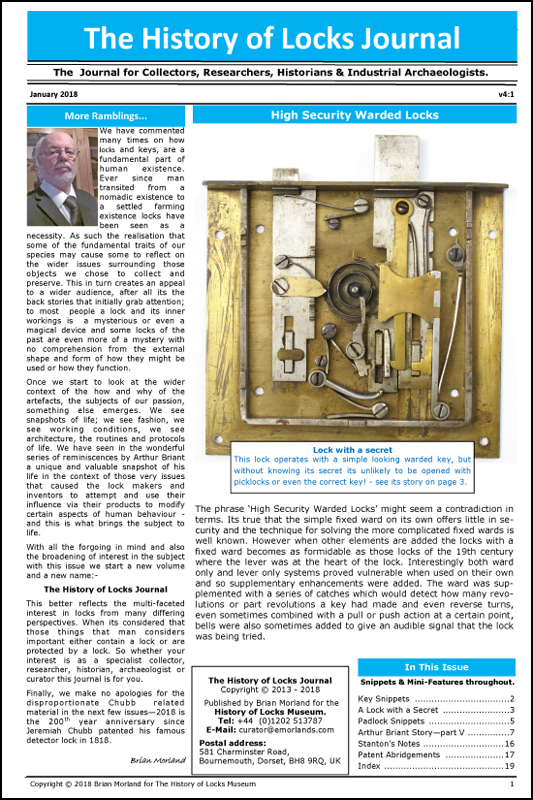 Half way round, on the window wall (cabinets 14 & 15), you will find the latest edition of the MLA-HoL History of Locks book which provides additional information about the artifacts on display as well as many of our 'Keyways' topics further developed.